Lately I have been really into fragrance, but I like one that doesn’t smell like everyone else’s. No offense to the B&BW lovers out there, but it seems like everyone has the same signature scent, and I just want my own unique scent! 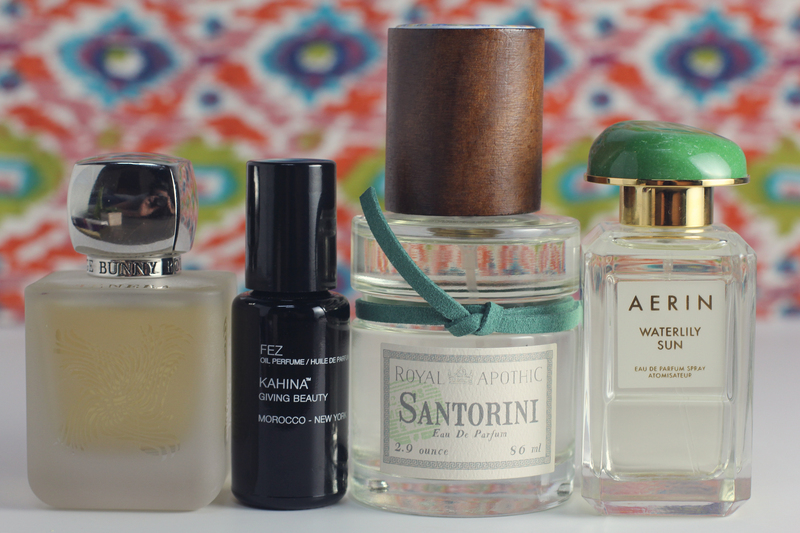 There are four fragrances I’ve been really into lately that aren’t very mainstream so I never hear about them. They are perfection and I’ve had them on repeat. Check them out! 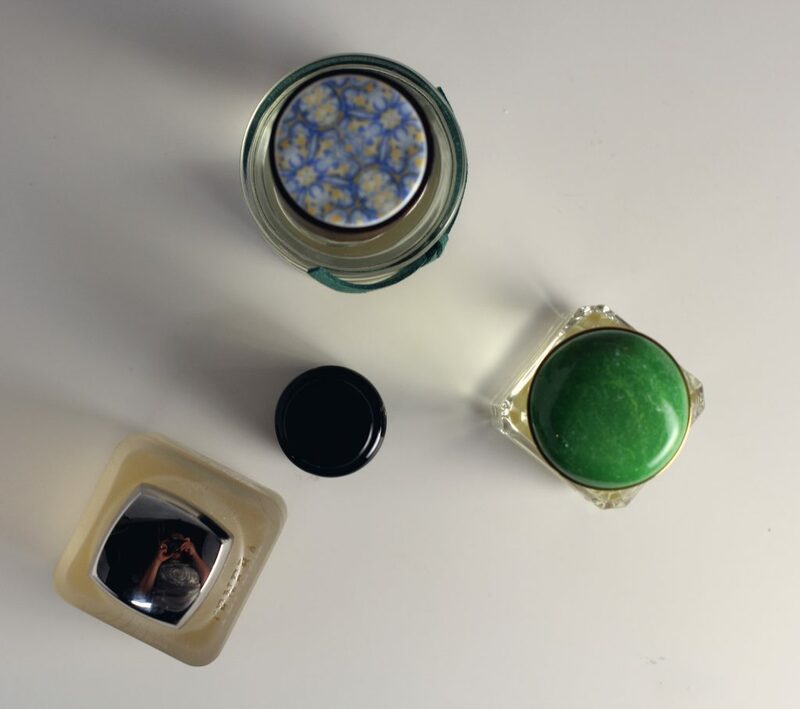 Of course it doesn’t hurt that two of the perfumes have absolutely gorgeous bottles adorned with the prettiest lids in all the perfume world. I had to share! Tenera is a rare perfume that I am really enjoying. The notes I pick up most from this fragrance are the vanilla and the leather. It’s really potent and I only need to spray myself once and I’m good or the whole day. The frosted glass bottle is so chic and exudes high end. It’s a gorgeous scent through and through, and I have to admit I can’t wait to try this when the weather cools down a bit. I think a complex scent with leather in the mix would be so intriguing in the winter when I actually wear leather to keep warm! 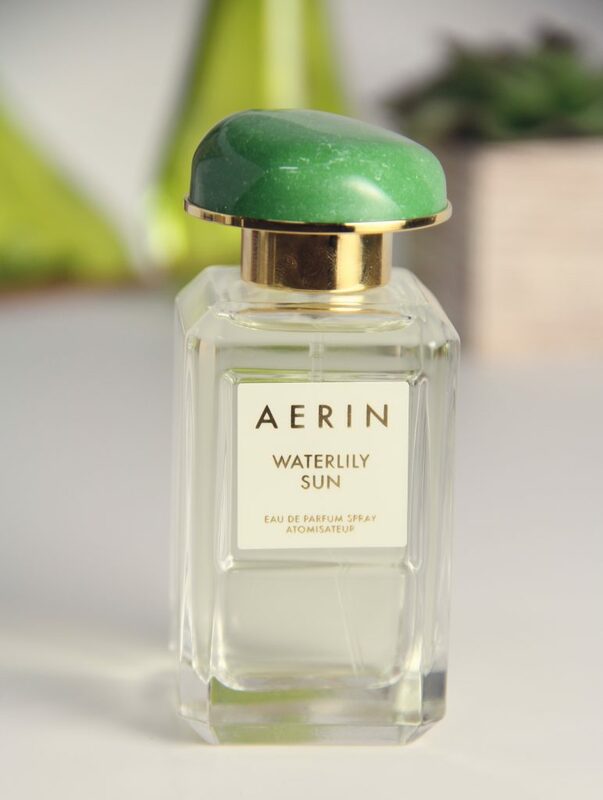 I wrote about Aerin Waterlily Sun in my CEW Beauty Award post but I just wanted to bring it up again because my love runs so deep. I’ve gotten a lot of mileage out of this fragrance since I’ve owned it. I love that it’s so warm and summery yet it’s light and fresh at the same time. It’s got a certain intensity about it that I love but the notes I am picking up most are the light jasmine and the soft watery notes. 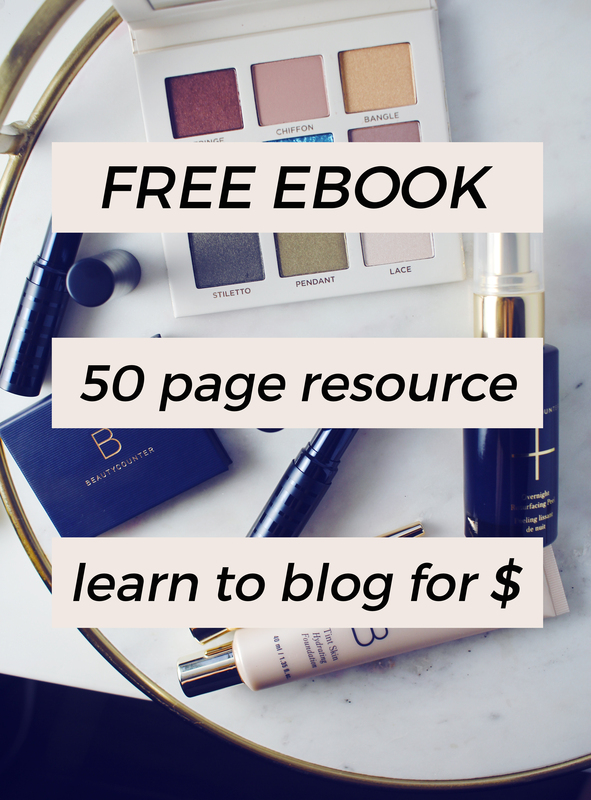 If you’ve never tried a high end perfume before, this would be a good place to start! The scent is divine and the bottle is just so pretty. You can’t go wrong! Top notes of sea salt and beach rose mingle with crisp lily over a driftwood base. 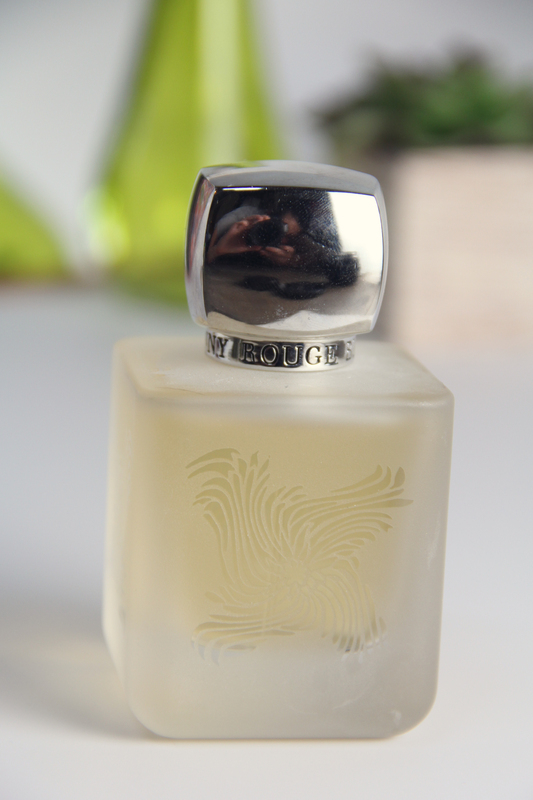 You’ll find this amazing fragrance at Anthropologie, if that gives you any idea of its vibe in advance. 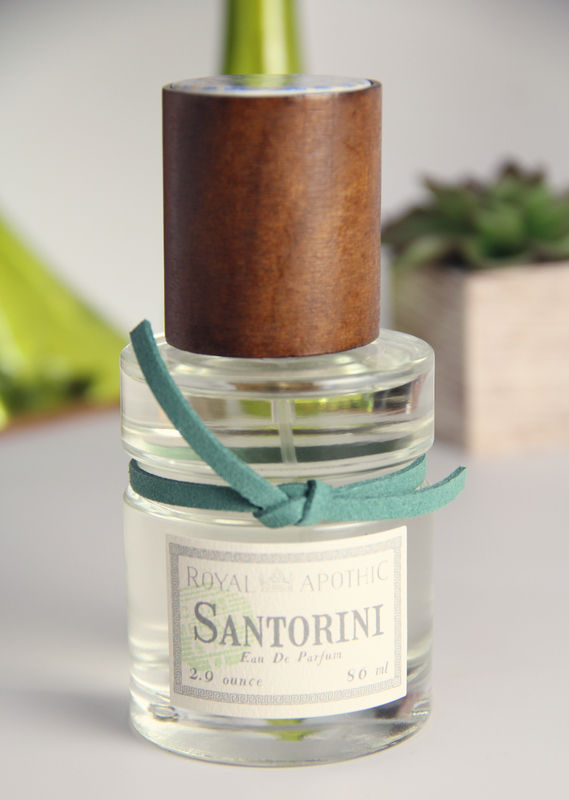 An earthy floral with herbal undertones is how I would best describe Santorini. If I had to choose my favorite of the mix, it would be this one. I’ve worn it almost every day since I’ve had it! It’s super fresh, I can really pick up on the rose scent, and it’s a perfect every day scent. It tends to suit my mood just about every day which is why I’ve gotten so much wear out of it! It doesn’t hurt that the bottle is absolutely beautiful. The entire line of Royal Apothic was inspired by the founder’s discovery of an apothecary guide at a London bookstore. I have fallen in love with a few other picks from the line so I will have a post featuring those soon as well! Tantalizing rose and orange blossoms are layered over the scents of antiquity; patchouli, vetiver and ylang-ylang with lingering hints of cumin and clove from the spice market. Fez’s ethereal but lingering fragrance is an earthy, warm blend to calm the senses and ground the spirit. I just tried the brand Kahina Giving Beauty for the first time and I’m completely obsessed with their body serum and then I discovered this perfume oil. It turns out that people were so obsessed with the scent of Fez in the body serum, that they were using it as perfume. Kahina determined there was a need for a perfume oil in the same amazing scent! This comes as a roll on fragrance and the scent is amazing to say the least. The complex essential oil blend contains some of the most natural fragrances you can obtain, and the result is the exotic, warm, sensual scent of Fez. I’ve only recently gotten into natural scents and Fez is so good! Once again I think I am picking up on the rose the most because I have an affinity for rose, but I also think it smells slightly spicy and there is a lot of complexity within the fragrance without being overwhelming. Also- sorry to torture you, but this one isn’t being released to the public until November! In the meantime, pick up their body serum in the same scent if you want to try it! I absolutely love wearing a fragrance that is not so easily identifiable. I guess it’s not a mystery anymore since I told you my four favorite unique perfumes! Do you have a trusty favorite brand of fragrance or do you like to choose something unique like I do? What’s your signature scent? Kahina is a brand I’ve been wanting to try. I’ll have to try the serum and oil! The RBR scent sounds amazing too. I love a good leather note in a fragrance. Thanks for the great recs! I want to try more from RBR and it just sounds amazing! Great choices! I am a spicey oriental fragrance love so I would love to try Fez and also Rouge Bunny Rouge Tenera. They could be right up my alley! I LOVE Waterlily Sun. 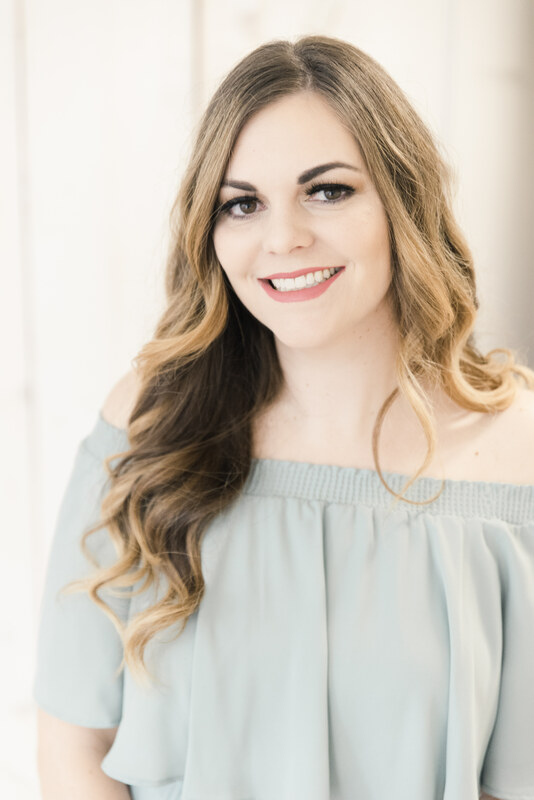 Just checked out your blog too and I’m a fan 🙂 Thanks for stopping by. I love discovering new fragrances! I think I’d love Waterlily Sun! I’ve heard soooo many people raving about that Aerin fragrance. I really need to try it for myself! I agree, so many fragrances smell the same these days it’s hard to find a unique scent! I love perfume bottles though I don’t wear fragrance. I want to smell Rouge Bunny Rouge Tenera on you! 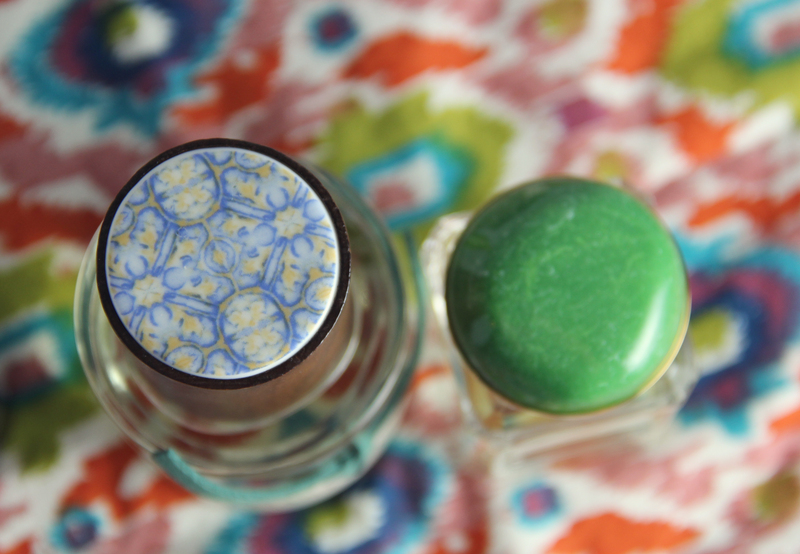 I have a deluxe sample of WaterLily Sun, and I wish it had that beautiful cap yours has! The scent is very citrus, but it’s complex – not your run-of-the mill citrus. Every time I wear it, my husband tells me I smell nice. Gotta love that! WaterLily Sun sounds like a scent I would adore! The bottles are gorgeous. I don’t really have a signature scent, I like to wear different scents.